There are a so many website design platforms and tools on the internet that let you create websites for free. This is good news for a lot of startups and entrepreneurs looking to get real bang for buck in the early days of a business when budgets can be tight. With these website design platforms, you don’t need to hire a website developer to create a great site, which can save you a lot of money. What you might not be aware of is all the hidden restrictions and potential problems that may come with a free website. These problems can potentially hinder your company’s growth and development. Let’s take a look at what you need to know to decide if a free website is right for you. Q: What platforms are there for me to create a free website? A: There are a lot of choices to choose from on the market, with Wix, Weebly, Yola, Strikingly, and Jimdo being the most popular. All of them have their strengths and weaknesses, but generally their features and performance are quite good. Q: What do I need to be aware of when setting up my website? A: Once you have finished setting up your website, you want to attract website traffic. If you don’t want to spend big on advertising, then you’ll need to set up your website to maximize organic traffic. This leads to the big question: Does your free website let you do Search Engine Optimization (SEO)? 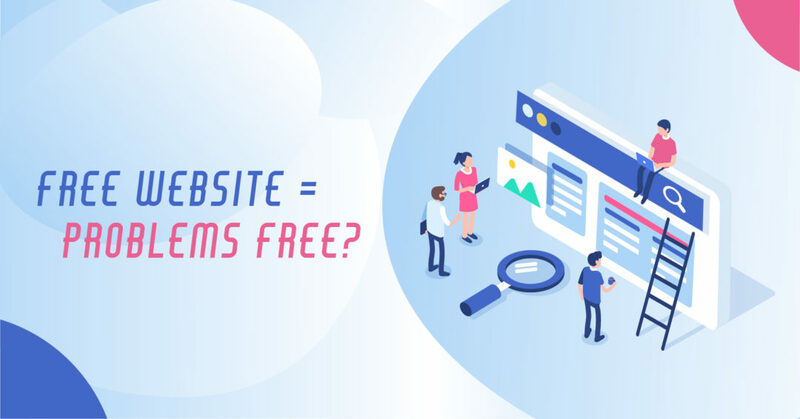 This is the key consideration when setting up your free website, because there are often many limitations on how much a free website can do in regards to SEO. Q: What are the common limitations and potential problems of a free website? Limits on the amount of pages. Most free websites have a cap on the amount of pages your website can have. If you want to expand your website, you’ll usually have to pay for premium services. Staying with the free option means you’ll to have to cut down on the amount of content on your website or combine similar pages on your site. It may feel like a small price to pay, but the quality as well as quantity of content is a big factor in your website’s rankings on search engines. You cannot customise your alt text. Alt text is the placeholder text for images on your site. They help Google to understand your website content better and can result in traffic from image searches. You cannot customise your domain name. Creating a website on a free platform means that you’re giving up the freedom of a customized domain name and settling for a subdomain. For example, if you’re using the website services of ABC company, your domain would probably be abc.freewebsite.com. These kinds of URLs are usually less trusted and respected by users, which can result in lower traffic and conversion rates. Q: Why does a website need SEO? Doing SEO for your website can help you improve your visibility on search engines and bring in more organic traffic so you can find your potential customers and start selling! Conversely, ignoring SEO means you won’t get much or any traffic without relying on advertising. Ads can be a good source of traffic, but they can also be expensive. And when you stop paying for ads, your traffic will completely stop, too. Q: There are a lot of website design companies on the market, with prices varying from a couple of hundred dollars to tens and hundred thousand dollars. What is the difference? Are they using a subdomain? If a website does not have their own domain, it will affect your SEO performance and brand perception. Is your website framework SEO-friendly? One-page designs are a big no-no in terms of SEO, so remember not to use one-page designs if you are looking to expand and harness the power of SEO. Separate the content in different pages, and strategically make use of different keywords across these pages to get better keyword rankings for different pages on your site. Q: How to achieve Search Engine Optimization? For a website to be fully search engine optimized, you need to make changes from different aspects and continue to make changes in relation to your strategy and marketing tactics. There are mainly two types of optimizations, on-page and off-page. On-page optimization involves everything that you can change about a website in its code, which includes titles, meta descriptions, images, and website content. Off-page optimization involves everything that you can do outside of your site’s code to improve traffic, including backlink and referral strategies. MWI provides website design and development, and search engine optimization services based on the latest best practices in user experience and search engine optimization techniques. We can help you create a website that will win you more business. Contact us to find out more.